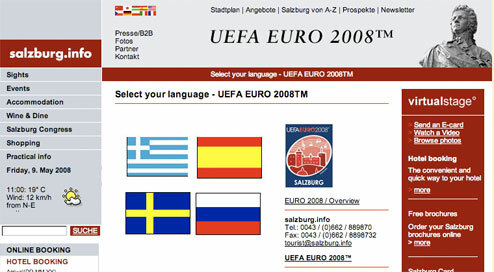 If the random number generator employed by UEFA in their ticket ballots had been calibrated a bit differently, right now I would be in the last stages of planning my trip back to Salzburg in Austria to see some matches at Euro 2008. I put my ticket application in before the final draw was known, and, as it turned out, I would have had tickets to see two matches featuring my adopted homeland of Greece. But it wasn't to be. Deprived of the chance to pay back to Murphy's Law the €5 I owed them when I left the country, I nevertheless was interested to see how much information about a trip to Salzburg for Euro 2008 you could get online. In fact, I was interested about all the host city information online, and so over the course of the next week-and-a-half, I'll be looking at the websites the host cities have built to support the biggest football event this year. Salzburg is hosting three games in Group D featuring reigning European Champions Greece. 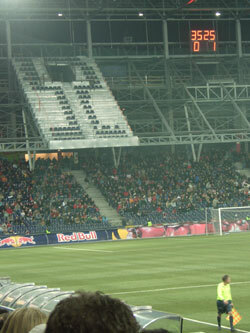 The matches are being held at the Stadion Salzburg Wals-Siezenheim, where I saw Red Bull Salzburg play an Austrian league match in 2007. Like some of the venues in the 2006 World Cup, the stadium has changed names specifically for the tournament. As Red Bull are not one of UEFA's commercial partners, games cannot be held in something usually called the 'Bullenareana'. 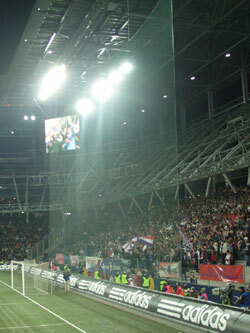 Like all of the host cities for Euro 2008, the Mayor is delighted, and work has been undertaken to improve the city's transport infrastructure. Salzburg has a blog especially for the tournament. It comes in a couple of languages, including English. It is powered by Wordpress, and has been going since July 2007. Blogrolls may have fallen slightly out of fashion these day in favour of more glitzy widgets like MyBlogLog, but the Salzburg Euro 2008 blog has a really useful set of static links in their sidebar, which pretty comprehensively cover anything you might need to find out about the city. There is also a lot of information on Salzburg's official local government site. This includes a welcome to the city translated into the languages of the fans who will be visiting. Fan embassy and drop-in centres are also being set up for each team, and matches will be broadcast live on large screens around the city. Preparations in Salzburg haven't run totally smoothly. 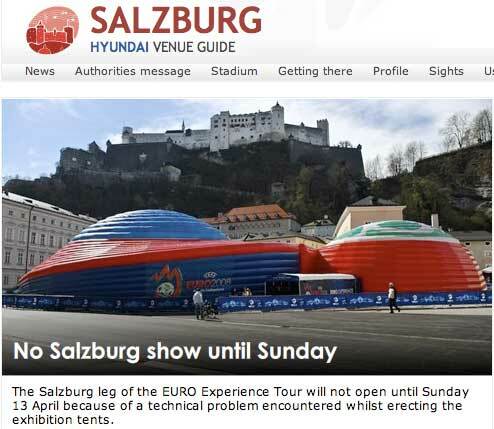 The travelling Euro 2008 roadshow that has been going around Austria and Switzerland had problems in Salzburg, and had to be postponed and then re-scheduled. This, from the official UEFA Euro 2008 site, shows the tents pitched up at the foot of Salzburg's fortress. Tomorrow I'll be seeing what I can find out online about another Euro 2008 venue in Austria that I might have been visiting if UEFA had been kinder - Klagenfurt. You might also be interested in Euro 2008 Chipwrapper - RSS feeds and a search engine for British newspaper coverage of the tournament - or Euro 2008 Fansivu - a mash-up of Twitter tweets, blog posts, and Flickr pictures from the tournament. By Martin Belam on 26 May 2008.